Obesity is not just a problem, it is a major contributing factor to a number of health conditions and complications. It is a medical condition that is associated with having an excess amount of body fat. It could be due to lifestyle, medical, genetic, environmental or any other factor. Obesity is different from being overweight. Being overweight simply means your weight is more than the ideal weight. Overweight and obesity are major risk factors for a number of chronic diseases, including diabetes, cardiovascular diseases, depression, arthritis, and cancer. It is measured by various means but the most common method used is Body Mass Index or BMI which is calculated as a person’s weight (in kilograms) divided by the square of his or her height (in meters). A person with BMI of 30 or above is considered as obese whereas BMI of 25 to 29.9 is considered as overweight. BMI is also believed to indicate the risk of developing any disorder related to the lifestyle like cardiovascular diseases, stroke, diabetes, hypertension etc. A higher BMI value indicates a higher risk for these disorders. We Indians are more prone to the above-mentioned diseases not just because of the genetic factors but also due to our unhealthy lifestyle. 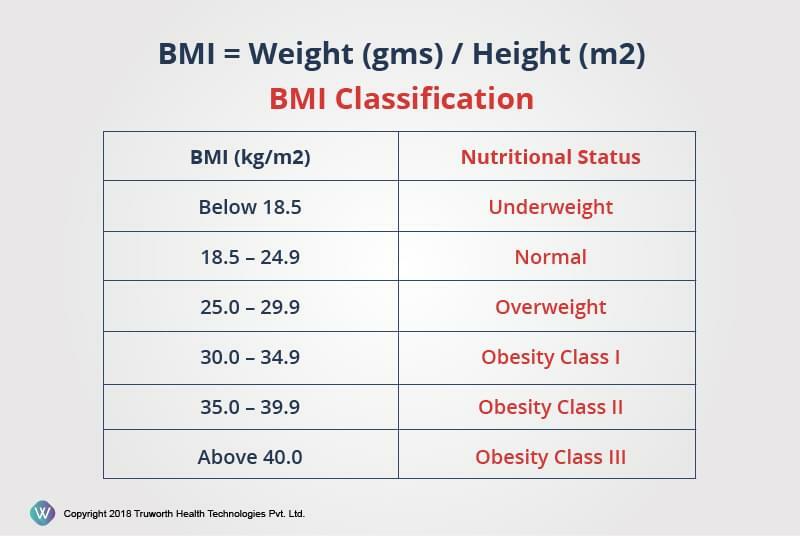 So, check your BMI now to know which category you fall into. And, if you are overweight or obese, don’t worry. Consult your doctor and nutritionist, they will help you out. By leading a healthy lifestyle, eating a healthy balanced diet, being physically active and doing regular exercise, you can prevent and treat obesity.